Pictured above is the eukaryotic process of cell division, also known as the cell cycle. Students know cells function similarly in all living organisms. 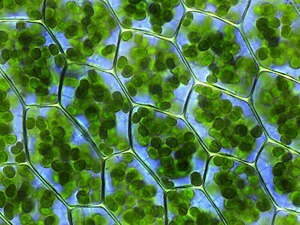 Students know the characteristics that distinguish plant cells from animal cells, including chloroplasts and cell walls. Students know the nucleus is the repository for genetic information in plant and animal cells. Students know that mitochondria liberate energy for the work that cells do and that chloroplasts capture sunlight energy for photosynthesis. Students know cells divide to increase their numbers through a process of mitosis, which results in two daughter cells with identical sets of chromosomes. Students know that as multicellular organisms develop, their cells differentiate. Students know DNA (deoxyribonucleic acid) is the genetic material of living organisms and is located in the chromosomes of each cell. Students know plants and animals have levels of organization for structure and function, including cells, tissues, organs, organ systems, and the whole organism. Students know organ systems function because of the contributions of individual organs, tissues, and cells. The failure of any part can affect the entire system. Construct scale models, maps, and appropriately labeled diagrams to communicate scientific knowledge (e.g., motion of Earth's plates and cell structure). This 3 week unit (parts of textbook chapters 2 & 3) will focus on three main concepts: cells capturing and releasing energy (Ch. 2.2), cellular movement of materials (Ch. 2.3), and the cell cycle (Ch. 3.2). As far as technology, we will be working on developing several skills centered around computer drawing and graphical layout. Here's an example of what your final product will look like. See below for resources and video tutorials. Interphase Gap 1: Cell grows and continues with normal functions. It duplicates organelles. It prepares everything needed for DNA replication. One centriole is present from the last division. DNA is "unpacked" in thread-like form called chromatin. Interphase Synthesis: Cell replicates all DNA. Interphase Gap 2: Cell continues to grow and prepares for mitosis. A second centriole is present. Chromatin "packs" into chromatids. Prophase - Chromotid pairs join to form chromosomes (two identical chromatids attached by a centromere). The nuclear membrane breaks down. Centrioles move toward opposite ends (poles) of the cell. Metaphase - Chromosomes line up in the middle (equator) of the cell. Spindle fibers from the centrioles attach to the centromeres of every chromosome. Anaphase - Chromatids of each chromosome split and are pulled by spindle fibers to opposite ends (poles) of the cell. Telophase - The cells begin to pinch and new nuclear membranes form. Cytokinesis - The cells divide. In an animal cell, a fiber ring splits the cells. In plant cells, a cell wall plate is synthesized between the two cells. At the end of cytokinesis, there are two new daughter cells. Be sure to follow directions carefully and watch the videos in the correct order. The time of each video is listed on the right side. The total length of video instruction is 1 hour 11 minutes and 49 seconds. Students will take at least double the time to complete the series with pausing often to do the work. Many students will need TRIPLE the time to complete the project. Plan your time well to make sure everything is complete by your due date. Different examples of diffusion (movement of molecules from areas of high concentrations to areas of low concentrations).